I do not feel entirely comfortable criticizing Steve Von Till’s self-titled project’s recordings. First, the man is an institution, with Neurosis, Harvestman, Neurot Recordings and everything he contributed to the development of progressive sludge and few other subgenres. But that alone would not stop me. More importantly, with the self-titled project Von Till releases some of the most personal and profound music, from the depths of his heart, so if I do not embrace it completely, am I then not showing appreciation to someone who was not afraid to wear it on his sleeve? 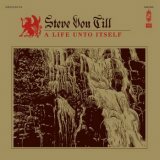 On A Life unto Itself Steve Von Till continues his journeys into Neil Young inspired dark Americana. Furthermore, atop of the earlier foundation of just his raspy whisper and sparse acoustic guitar A Life unto Itself brings more string arrangements, more percussion and a touch of synth into the picture. Yet, to me, and I am afraid to many others, the overarching question still remains. Are these recordings so personal and private, they, by definition, become less engaging? Will there be enough flow and variation to carry the listener for 45 minutes? Compositions like Birch Bark Box and A Language of Blood do build on around some centerline stories, but the title track, for example, is basically spoken poetry with acoustic strum and vocal line proceeding in strict alternating static manner for 7 min. Steve’s dark scratchy voice always reminded me a lot of Chris Rea, and Birch Bark Box does begin like an intro to a famous Auberge, but definitely becomes something more, gaining depth, other instruments having a crosstalk with the electroacoustic guitar. Viola cuts through the fog drifting above the lake of Chasing Ghosts, the initial haze set on by piano’s dark notes. Night of the Moon has electronic shimmering, displaying a rare episode of very slight distortion, the whole record otherwise being so crisp and clean. A Life unto Itself is very folky, as advertised, but to me it bears some specific Celtic touches. The second half of Known but Not Named is a hybrid of a shaman song and slowed down Gary Moore, Birch Bark Box and In Your Wings also having their settings, at least in part, somewhere around the Emerald Isle. There is absolutely no question I experience a plethora of emotions when listening to Von Till. Calm deep serenity helps my world outside to slow down, to be experienced for a number of individual distinct pictures that it is. Yet, when the record stops playing, as much as I appreciated it WHILE it was on, I somehow do not have a need to re-listen. It is if I was walking in the park, or by the river, and there was this lonely musician playing, pouring his heart out. I stopped, definitely appreciated, and lived in the moment. I even put some money in the open guitar case. But once I continued my journey, or the day after, I only remembered a general emotional outline, not the concrete sounds or melodies played just a minute or a day ago.